Remember the Magic Slate you had as a child? You could write anything on it, and then lift up its plastic sheet to erase everything. Now there’s a mouse pad with a magic slate built in. Write down notes, passwords, anything you want to remember, and as soon as you lift up the contact sheet, Voila! It’s gone. You can use your finger or the built-in stylus. 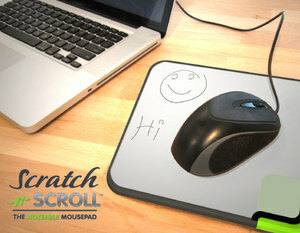 The mousepad is called the “Scratch-n-Scroll” you can get it at quirky.com for $10. Thirty cents of every dollar made from the sale goes back to the “Quirky” community, a social networking group which includes the inventor of the idea, well as all people who voted on, commented, and rated the project. By the way, you can only buy a quirky product if enough people commit to it and it goes into manufacturing. When we clicked to “commit” to our scratch pad, we were number 171 out of the 225 commitments necessary to put it into manufacturing. Your credit card isn’t charged unless it goes.